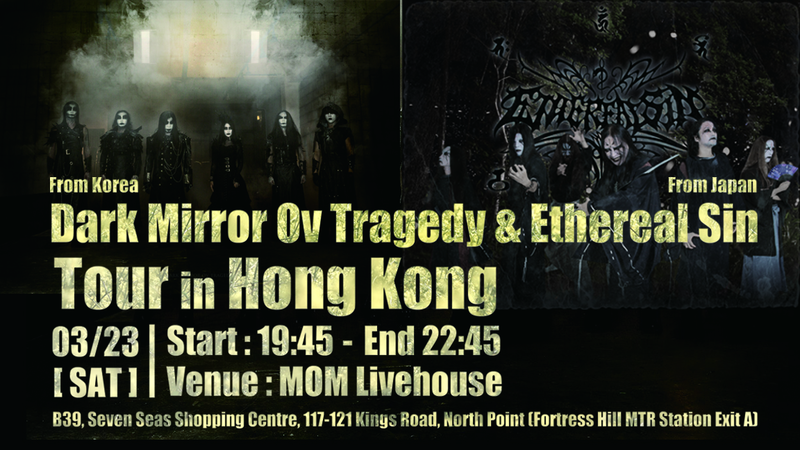 DARK MIRROR OV TRAGEDY - Symphonic Black Metal From Korea playing live in Hong Kong to support their new album released Nov 2018 "THE LORDS OF SHADOWS"
We are proud to invite special guest band from Japan to support and enhance this show [ETHEREAL SIN] - Elgeaic Black Metal , they have just release their 3rd full length album "Kakuriyo" January 2019. I have known both bands for a long time and had the privilege to sign Dark Mirror of Tragedy 2nd album "The Pregnant of Despair) on my ex-label Trinity Records Hong Kong 2009 , we also had them perform in Hong Kong in 2009 . - Human Betrayer - Melodic Deathcore - new exciting band that are process of completing their album ! INFREE RECORDS now has held 7 shows with 26 bands playing in total never overlapping , we hope to keep this going on in 2019. Ethereal Sin formed in 1997 in Japan by Yama Darkblaze.